“As firefighters and paramedics, we live in these firehouses. What effect will these towers have on us? What are the risks to our neighbors? It’s a no-brainer that LA County should at least have done a proper study before before putting 200-foot high-power microwave antennas on top of our heads." Fighrfighters Local 1014 has a webpage dedicated to stopping towers because of a plan to install them on over 200 of their stations. Click here to listen to a radio spot the firefighters put up on the issue of cell tower radiation. The Firefighters won! and the towers on their stations were stopped after the testimony shown on this page. Listen to this mother speak eloquently on the topic in her testimony. 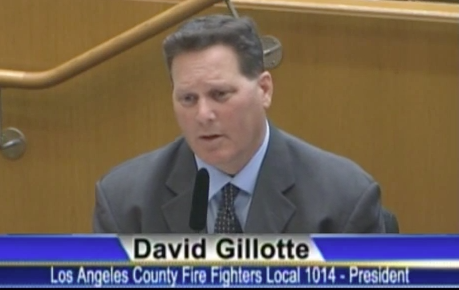 President of the United Firefighters of Los Angeles gives his testimony to the LA Board of Supervisors in this video. This Position was initiated after increasing complaints among firefighters with cellular antennas on their stations coupled with a California study showing neurological damage in California firefighters with antennas on top of their stations conducted by Dr. Gunnar Heuser. Opposes Cell Towers on Their Stations. “UFLAC will strongly oppose the use of Fire Stations as base locations for cell towers"
Download 9/2014 Letter by LA Firefighters Union Local 112 asking for an immediate halt to cell towers on fire stations. Download Letter by Frank Lima of the LA Firefighter Union (in video above) asks that they "cease and desist" from constructing cell towers. If Firefighters don't want towers on their stations...why would we parents want them on our school playgrounds? Why would we want wireless routers (which are like mini cell towers) in our children's classrooms? Think the Firefighters are "overly worried? " Listen to Dr. Miler speak in his testimony below.